Because our lives could always use more people grabbing for our waist. 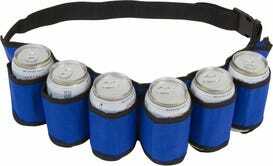 The EZ Drinker Beer and Soda Can Holster Belt is down to $7.19 at Amazon. Pick one up for tailgating, your next get-together, or long-distance hike*. * This is a joke. If you go hiking with a sixer of beer, you're probably going to have a bad time. And romping through the woods with 6 cans of liquid strapped to your waist is heavy and terribly inefficient.